When the images of earth cling too tightly to memory, when the call of happiness becomes too insistent, it happens that melancholy rises in man's heart: this is the rock's victory, this is the rock itself. The boundless grief is too heavy to bear. These are our nights of Gethsemane. And so it was on November 4, 2013. Today, of course, there will be nothing approximating the crucifixion unless Barack Obama, still as president the head of the Democratic Party, declares a "shellacking" as he did on November 3, 2010. He thereby signaled to Republicans to claim a mandate, encouraging them to have their way with him and his party. have two key pieces of leverage the night (sic) time they want to go after programs they don`t like and cut them. One, they will be able to pass spending bills with a simple majority through a process known as reconciliation, and that is important because it means they don`t have to meet the 60-vote filibuster threshold. They just need a simple majority. And number two, they will be able to control the amendment process which sounds on secure and boring but is actually the most powerful thing you can do in the United States Senate, because they can add whatever they please to a spending bill and send it right to the president`s desk, and the president will then be presented with a choice, veto a bill chock-full of GOP amendments and thereby risk a big messy government shutdown that hurts millions of people, many of the people that are his supporters and constituents, or sign a bill chock full of GOP amendments and do damage to hisagenda and lots of struggling Americans who are counting on him. And this isn`t just my pet theory of how this play out. 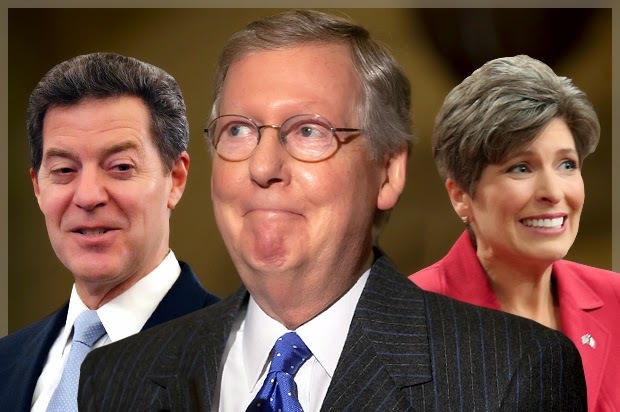 Mitch McDonnell made an explicit promise to do exactly, precisely what I`m describing, if Republicans get a Senate majority tomorrow, telling "Politico" over the summer, Obama, quote, "Needs to be challenged and the best way to do that is threw a funding process. He would have to make a decision on a given bill whether there`s more in it that he likes than dislikes." A good example, McConnell said, is adding restrictions to regulations from the Environmental Protection Agency. Let me be clear for a second, the regulation the EPA is issuing right now for coal-fired power plants is basically the most important thing the government is doing right now. The biggest part of the Obama domestic policy legacy since he was reelected and those regulations are set to reduce emissions and more importantly could permanently alter the trajectory of American power generation towards renewables and away from coal and the carbon pollution that is threatening mass catastrophe and all civilized life. Bottom line: Republicans were just rewarded, and quite handsomely, for doing little beyond saying “no” to President Obama. They shut down the government last year and paid no noticeable price for it. The voters who handed the Republicans the Senate didn’t send them there to compromise with Obama or cut deals with him. The Republican “mandate,” such as it exists, is to be anti-Obama, and seeing as that’s worked out for them pretty well, there’s no reason to think they’ll switch it up anytime soon. Wilson, Maybe. Ham Sandwiches, No. But Of Course, "No Boots On The Ground"